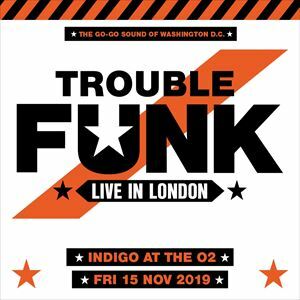 The Go-Go Sound of Washington D.C. comes to London for one night only when one of the key pioneers Trouble Funk fly in to perform a European exclusive date. Go-Go is a non-stop, percussion-heavy, older cousin of Hip Hop. A blend of up-tempo 70's funk with a 60's style horn section, percussion breakdowns, booming vocals and the trademark call-and-response audience participation, Go-Go Music is best experienced live in concert. Trouble Funk burst onto the scene in the 1980's with signature hits 'Pump Me Up', 'Drop The Bomb', 'Let's Get Small', 'Say What?' and more. They toured the world alongside George Clinton, Red Hot Chilli Peppers, UB40, and Def Leppard. The band's music has been sampled by Will Smith, Public Enemy, EPMD, and The Black Eyed Peas amongst many others.